This is part 2 of my adventures in job-hunting at GDC 2010. Last time, I was disappointed by the small number of actual studios in the GDC "Career Zone." I had some okay encounters and some pretty embarrassing cringe-inducing encounters. And then I went to see Valve. This part of the floor was profoundly deserted and I felt like some sort of trespasser, but then I checked for my balls (yeah, still there) and decided that someone would yell at me if I wasn't supposed to be there. Then I saw it -- in the center of the maze was the "Steam-plex," complete with interview rooms and a lounge and a reception and food table and whoaaaa. It was more than a booth -- it was a mobile office, an outpost, a citadel. I wish I thought to take a picture. I didn't expect to get anywhere, given my dismal results talking with Crytek and Bethesda. I prepared myself for blank, vacant stares followed by me hastily leaving a CV on the desk, apologetically bowing for wasting their time, and then promptly running out to the front of the nearest speeding bus to kill myself. The man at the front ("Charlie Brown" -- the bestest name ever, though I'm sure he gets that a lot) seems surprised to see me. He hands me a form. I fill it out and hand it back to him. That's when he says, "Oh, there's Robin. Looks like he's finishing up right about now... you can go with him." And then I'm sitting at a table with the lead designer of Team Fortress 2. Then I'm watching him play Radiator 1-2, Handle with Care. I (foolishly?) name-drop a bit frantically as he plays -- "Rock Paper Shotgun this, Adam Foster that, Marc Laidlaw said this" -- but he doesn't mind, he chuckles and takes it all in stride. There's no mocking here, no presumption, no (well-deserved) arrogance. He's just being such a class act right now that I'm perplexed as to how comfortable I am, chuckling along with him. He's clearly not one of the Old Gods who demands sacrifice. I went in somewhat confident about my mod: I've prototyped it, playtested it, revised it, and people generally seemed to like it. Every time he chuckles at something I designed to be funny, it takes all my willpower not to scream like a 12 year old girl at a Jonas Brothers concert. But then, while playing, he starts talking and talking and talking, never making eye contact with me. Comments, design flaws, anecdotes -- like a golden hail of machine gun fire sputtering out of his mouth. Apparently whenever Robin Walker playtests something, he narrates his session in this strangely hypnotic steam-of-consciousness mode that sounds something like this -- "there's a crate in my way so I can't read the coordinates on the walls and I don't know where I'm supposed to put this but now I don't want to put the crate down because then I'm scared it will break but I can't see where I'm going and now I can't decide whether to..."
He continues, "... but now as a player I feel like I have to break nine crates that leaves me with one live left so I can see the maximum amount of content and I don't miss anything and then from there I will just quick save and quick load over and over and the volume is too low on that line I couldn't hear what she was saying and now that I've broken a crate I expect the dialogue on-screen to change but now it doesn't so I'm kind of disappointed and..."
Then Charlie Brown pops in. "Hey, it's 2. We gotta close up." I look outside -- the rest of the Steam-plex is deserted. It's just me... It's just me, holding up at least half a dozen Valve staff members from returning to their Very Important Work... And they're all standing there, next to the front desk, shooting me blank, vacant stares. 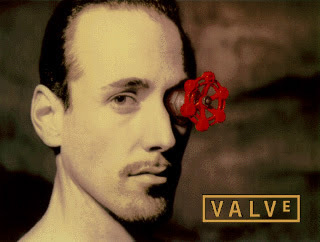 I realize it's meaninglessly common to adore Valve -- if you like playing video games at all, you like Valve, it goes without saying -- but those 25 minutes have solidified their reputation in my mind. Without hesitation, he sat down with me for a pretty long time and earnestly critiqued my work. No one else did. So, I'm impressed, to say the least. ... By the way, I'm never washing my hand again. Maybe some of the oils from Robin Walker's hand got onto mine, and now I'll have a fraction of his talent and my levels will design themselves. He should bottle it and sell it: "Secretions. By Robin Walker." Robin Walker is the most charming man alive. If I hadn't brought my laptop, the meeting probably would've lasted like 1 minute and might've been a repeat of talking to Crytek and Bethesda. Bring your laptop when you go to GDC! I don't care if it's heavy, just bring it! The best way to know a game is to play it.